Every time April Fool's day rolls around, we have a birthday party. My computer has been down in the picture department until now, so this post is late, but better late than never! Conner has had a birthday, yeah! 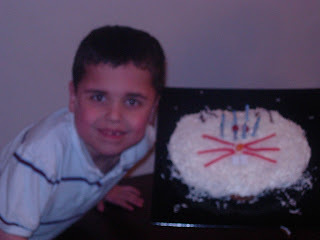 Our big boy is now 8! Yikes, that makes me feel really old. I feel bad for the guy cause his birthday always falls on spring break, so it's hard to find party goers that are in town, but we kinda had a birthday week instead! We went to a movie, Monsters vs. Aliens. I have to admit when they changed Susan's name to Ginormica, I kinda looked around like someone was looking at me, kinda is like my name. Conner had not been to the new McDonald's since it had opened, so we headed there for lunch and play time, yeah for all those clean toys! After lunch we went to pick up Conner's present. He got bunnies, ti's the season! They are fun. 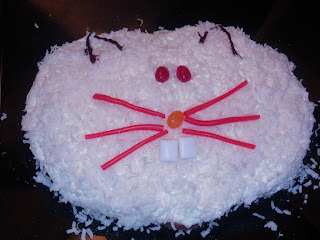 Since the bunnies were such a hit, we decided to make his birthday cake a bunny. I tried my best. It was really yummy. 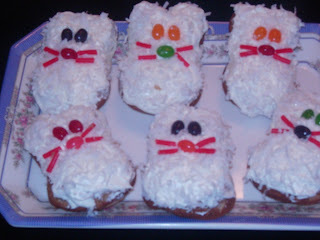 I made little ones too so everyone could have their own little cake! We had a few friends and family over and it was a fun little party. We love you Conner! Sorry we missed your party! Cute cake! At first I didn't get the "Ginormica" comment, but then I caught on - ha ha!